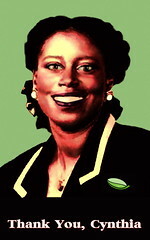 What follows is my edited (for length) interview with former Congressional Representative and Green Party Candidate for President in 2012, Cynthia McKinney. I interviewed Cynthia is a warm studio in Atlanta, Georgia in the summer of 2009—but the interview below is still relevant and fascinating. Cynthia and I are very comfortable with each other and I hope her humanity can shine up from the page to your eyes and into your heart. Cynthia has been in Libya on a fact-finding mission to discover, then reveal to us what is really behind the US-NATO bombardment of Libya—I encourage all to go here to read her reports. I supported Cynthia when she ran for president in 2008—and voting for her was the 2nd proudest vote I ever cast (voting for myself for Congress edged Cynthia out a wee bit), and every day that she is dodging bombs, or demonization campaigns, working for peace and justice makes me even more proud of her and relieved that I voted for such a courageous, compassionate and intelligent person—not the dog and pony show we currently have “running” this nation. Obama, like the one before him, plays fast and loose with facts, and the children of others. Cs: Cynthia, thank you so much for agreeing to be a part of our documentary (now, book). Cm: Cindy, you are my friend, you are my inspiration, and you are my leader. Cs: Likewise. So, when we started getting into Venezuela electoral fraud, we wanted to talk to somebody about US electoral fraud and you were our first choice. We’re really happy that you were available to do this. One of the things that the ruling class of the world, not just the US, will say about Pres Chavez is that he is illegitimate because there is election fraud in Venezuela and that they fix the elections. We know that elections have been fixed since the beginning of time, no matter how hard you try to make them legitimate, there’s always some way to mess around with them. But people like yourself, and Robert Kennedy Jr., Bev Harris, Bob Fitrakis in Ohio, Greg Palast, you’ve brought to light the overt electoral fraud here in the United States, especially in 2000 and 2004, and not only is there election fraud but there’s just millions of instances I think of disfranchisement of people of color voting. Could you detail some of the abuses of not only electoral fraud in the United States but disenfranchisement? Cm: I think we really have to start with the founding fathers, who felt that the people who look like me were only 3/5 of a person to be counted. Cs: I wasn’t even in the Constitution. Cs: People that look like me weren’t even in the Constitution. Cm: So, we begin with an imperfect democracy, and we have to understand that, and the challenge of various movements in our country has been to perfect our union and so of course we have had women who fought for probably 75 or 80 years for the right to be able to cast a vote. And we have black people whose struggle for the right to vote is legendary, and most recently we have our more recent immigrants who have come to this country who are language minorities, and they too have had to struggle to be included in our representative government. So, with an imperfect foundation, what are some of the manifestations we have seen recently that would give us pause as we say we are going out into the world to bring democracy to the rest of the world? Well of course we can’t take democracy anywhere if we don’t have it at home. You have to have it to share it. And we don’t have it. Why do I say that? Not only because of those people who were never included in the idea of enfranchisement, of the founding fathers, but the whole struggle to include people from every shape and language and color and hue and ethnicity so that they could have a place in our republic. Now, in 2000 I guess you can say that was almost the pinnacle of disfranchisement, because you had a group of people to sit in a room and decide whose vote was going to be counted and whose vote was not going to be counted. Who was going to be allowed to vote and who was not going to be allowed to vote, and who was going to win the election, and who was going to be prevented from winning an election. All that came about in the 2000 election for president and there, on the backs, really of black people’s hopes and aspirations and frustrations, where black people almost had a 100% turn out in Florida. Cs: How did that happen? How did they do that? Cm: Well basically somebody somewhere decided they would use the convicted felon’s lack of voting rights to their advantage, to the Republican Party’s advantage. We know that we’ve got social injustice, criminal injustice that’s administered by the justice department in our country, so therefore blacks bare the brunt of this problem of convicted felons. And because the majority of those people who in certain states convicted felons cannot vote, and therefore Florida happened to be one of those states, so what happened was the states where there were republican governors sent their lists of convicted felons to Florida, which had Jeb Bush, George W Bush’s brother as its governor, so you had Christy Todd Whitman from New Jersey send down her list of convicted felons. You had George W. Bush who was the governor of Texas send over his list. You had the Ohio list come down to Florida. All these Republicans are sending over these names of convicted felons. But guess what? That was against the law, but they did it anyway—and got completely away with it. This is Election Day, there’s nothing that Mr. Smith can do about it. Well, there should have been something that he could do, and that’s what we saw in 2004. There’s something called a provisional ballot, so then if Mr. Smith goes to the polling place and they tell him, “well you’re a convicted felon,” but Mr. Smith says, “I am not a convicted felon, I want to vote,” then he’s supposed to be given a provisional ballot on which to vote. The only problem is, the provisional ballot didn’t count. Cs: Was that in the Help America Vote Act? Cm: Yes, which is what funded the electronic voting machines, which is another layer in the way in which voters in the United States were disfranchised. Now it starts out that you’re targeting the black vote for disfranchisement, those people in 2000 were going to make sure they have machines that don’t work, were going to make sure that they don’t have enough machines, were going to make sure they had confusing looking ballots, anything that could confuse the voter, that was done in 2000. In fact, including dispatching police to the precincts so they would establish roadblocks and check points. Now if you happen to have an outstanding warrant, or some reason that you would not want to pass by the police, then you can’t go to vote, because that’s where the police are. All of this was done in 2000. But it wasn’t just done in Florida; it was done all over the country. But, people paid attention to Florida because of the Electoral College, which is another way voters in the United States, are disfranchised; it all came down to Florida and the electoral votes in Florida. Cs: Tell us why the 2000 vote in Florida was so important to black people. Cm: I don’t want to say black people were agitated; they were motivated, they were motivated for various reasons; first of all, you also had the upcoming, in 2001, Durbin World Conference Against Racism. So you had various organizations all over the United States that were connecting with each other. You had the black community connecting with the Latinos and the Native Americans and the Asians and the progressive whites, we were all working together, building towards the 2001 Durbin World Conference, and then they were also able to feel empowered because they were working with the African continent, they were working with Europeans who were very supportive at a certain level, not at the governmental level but at a certain level, the grass roots level, they were very supportive. People in Asia were supportive, and the indigenous people, they were supportive throughout Latin America. So there was this synergism and that was very, very real all over the United States. That was one thing. Then, there was also the fervor that had been particularly directed toward the people in Florida, because George W. Bush’s brother was the governor of Florida. So you’ve got the governor of Texas, and his brother is the governor of Florida, now Texas is like number two or three most populace state in the country, and you’ve got Florida which like number three or four most populace state in the country, so you’ve got one family controlling at least two of the top five states in the entire United States. Jeb Bush had done the race politics and was trying to erase affirmative action and the black community was very motivated to show George W. Bush that not only are we going to show you a thing or two, but we’re going to get rid of your brother come next election. Cs: A lot of people, even so-called progressives, especially Democrats, want to blame Ralph Nader for Gore’s loss in Florida. Can you dispel that myth for this documentary? Cm: Well, you know, the democrats have a vested interest in blaming someone else, because the voters that are most loyal to the democratic party are black voters, and it was black voters who were completely disfranchised in Florida, and it was on the black vote and the denial of the black vote that George Bush schemed his way along with those around him in the Republican party, to the White House. Then the Democratic Party had something to say about a stolen election. But guess what? They didn’t say anything. You had the person who lost the election, (who actually won the election), Gore. Gore told people, don’t protest, and when Gore had the opportunity to say let’s recount the entire state of Florida, and then they would have found the tens of thousands of black votes that were never even counted, Gore just said, “let’s pick this precinct and this precinct and this precinct”, so it was a token effort. The people, who were really left holding the bag, were the black voters who supported Al Gore. So, black voters were stabbed in the back by the Democratic Party. Now the Democratic Party can’t say: “we’re sorry, we didn’t do what we should have done,” they can’t say that, because they rely on the black vote exclusively. You see this at the time of the redistricting, when the Democratic Party in particular wants to have enough blacks in a district so they can win, but not enough blacks so they can have self-determination in that district. (This is the game that will be played out in the next few years as we go through the census and reapportionment and redistricting.) And the Democratic Party didn’t do that. The Democratic Party allowed the theft by the failure to count black votes to stand. So they (Democrats) look for someone else to blame. And of course, there’s the third party candidacy of Ralph Nader, so they like to blame Ralph Nader. The fact of the matter is, if all of the votes in Florida alone had been counted, if they had just demanded that the black votes be counted, Al Gore would have won Florida, and he would have won the election. It’s on the Democrats that they let down their most loyal voters, and they let down the country, and as a result of George W. Bush’s policies: the Democrats let the world down. This entry was posted in All Posts News Politics and-or Videos, Crime, Crime and or Corruption, Dandelion Salad Featured Writers, Elections, Politics and tagged Cindy Sheehan, Cynthia McKinney, McKinney-Cynthia, Sheehan-Cindy L. M., Voter Suppression Voting Rights. Bookmark the permalink.